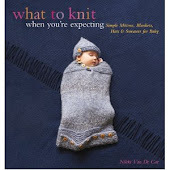 What To Knit When You're Expecting: One! You are one year old today. You have no idea what this means, and clearly have no idea why everybody keeps congratulating you--you have this very definite expression of "Huh? I didn't do anything. No new tricks today...can I play with this shiny paper though?" 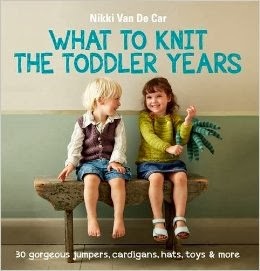 What it means, child, is that we have all of us survived the first year of your life, with the three months of nonstop crying, with the endless babyfood-making, with the Shhhh! She's sleeping!, and with life coming to a halt whenever you decide that it should. We should all be getting presents, not you. But then you're the one who had to suffer through those first three months of being so miserable, and then once you realized there was stuff in the world that interested you, you found that you were constantly restrained from investigating the things that interested you the most. "Cords and medicine cabinets are not for babies"--that's all you ever hear. You live in a state of either extreme excitement or extreme exhaustion, but you are never, ever bored. Yesterday you giggled for ten minutes when an ornament wiggled when you batted it. This morning you crawled around with a shoe in your mouth--I'd give you the benefit of the doubt and say you were pretending to be a puppy, but you've never met one. This morning you gave me a kiss when I asked for one, and yesterday you tickled me. You know how much you are loved, and you love us all with every fiber of your being, like you will break with it. You are the greatest joy in our lives, and we are grateful for every moment of this past year. And we'll keep giving you presents if you just keep on being you. You've got the perfect points- we deserve the presents, lol. Congrats on a beautiful, wonderful, amazing One year old!! Happy birthday, Willow! We've never met but we've watched you grow from a tiny baby to a beautiful, dimpled toddler. And thank you, Mom, for sharing her with us. Vicki and Emily. Welcome to the second year - you have no idea how much fun it is! Happy Birthday to Mom and baby both! Good job keeping her alive and happy! She's adorable and I love all the pics from this last year. Congrats on surviving the first year without completely losing your mind! Yay! Happy Happy Birthday little lady! Many congrats you mommy and daddy. Happy birthday and congratulations for having made it so far! Happy Birthday Willow! My little Bamsegutt and I have loved reading about your progress this year!